18 year old Kelley "Turtle" Tibbs,legendary ringleader of the teenage lesbian scene, lived in the city's gay Carytown district in Richmond, Virginia.Her home,a brick row-house was the meeting base for all the surrounding shaven headed female teenagers and always had lots of beer.Melissa Etheridge provided the vocals in the form of loud music on the stereo.Tracy Bitner was Turtle's tall possessive girldfriend. 18-year-old Stacey Hanna, a new roommate who moved east from Lynchburg had a huge crush on Turtle. Stacey tried numerous times to drive a wedge between Turtle and Tracy and eventually this backfired.One night, Turtle, Tracy and two friends literally dragged Stacey to a wooded area and kicked, slashed, and stabbed her to death. This true crime book is about a lesbian love triangle turned deadly.What struck me most about this book was how Kelley Tibbs was able to manipulate these two admirers to such an extent that one was eventually murdered.She was saying one thing to the one and another to the other one.Things like "I like you" to Stacey Hanna and then to the girlfriend Tracy she would say that Stacey won't leave her alone and is pursuing her.She was then in a spot (between a rock and a hard place)when Tracy decided to take action and she had to go along.She,alone had caused this situation to erupt to the point of murder through her deceit and lies.On the other hand,as a reader, I had this constant feeling of trouble brewing,all the time.I also believe if it had not been Stacey Hanna that died it would have been someone else.This situation was a "murder looking for a place to happen".One of the girls even told a detective"just one of those times...when somebody had to die." 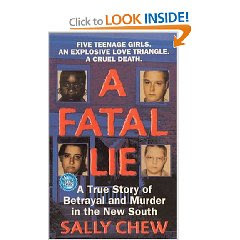 Sally Chew includes quite a bit of dialogue from everybody involved so you do get the feeling that you are getting the whole story,from the perspective of the defendants at least.That fact also re enforced the idea I had that it was a case of somebody,anybody,had to die.The victim and her family do not feature prominently in the book.There was also,unfortunately for me,not a lot of background and early childhood details on the girls and that information would have really added to the book.The details supplied however did carry through and made for a good read regardless. I was also unable to see any other true crime books written by Sally Chew so I guess this is her only one.